Cliftonville's recent impressive form, which helped them retain their league title, has been reflected in a double awards success for the month of April. Chris Curran, who played a crucial role in their strong finish to the campaign, has been named player of the month by the Northern Ireland Football Writers. 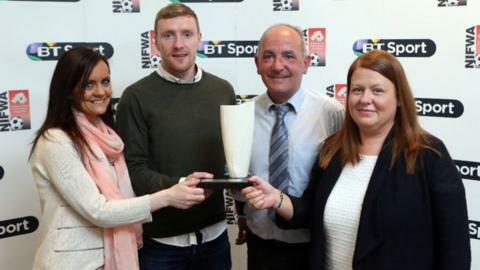 Reds manager Tommy Breslin scooped the manager of the month prize for the third time in succession. It is the eighth time that the Reds boss has been awarded the accolade. Curran, who was recruited from Ballinamallard at the end of last season, collected his first gong after scoring five goals for the champions last month. One of those strikes came in the decisive 2-0 victory over Portadown at Shamrock Park on Easter Tuesday. For Breslin, it was a repeat of the hat-trick of awards he secured last season from November 2012 to January 2013. Both will be present when the annual awards are given out at the writers' banquet on Monday night. Solitude forward Liam Boyce had won the top player award for March while his strike partner Joe Gormley was named named as the Ulster Footballer of the Year by the Castlereagh Glentoran Supporters' Club last week.